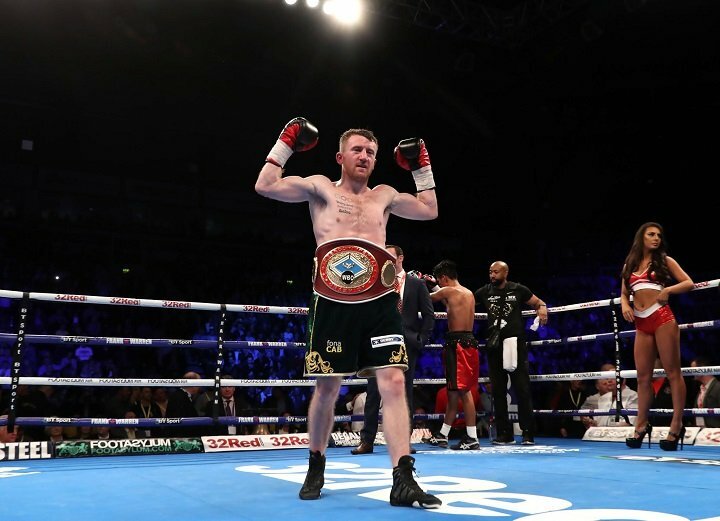 Paddy Barnes has claimed his fifth professional win and the vacant WBO inter-continental flyweight title with a sixth-round stoppage victory over Nicaraguan Eliecer Quezada at Belfast’s SSE Odyssey Arena. Fighting on the ‘Frampton Reborn’ undercard of his friend Carl ‘The Jackal’ Frampton, the three-time Olympian was in impressive form. Barnes dropped his opponent with a body-head combo just before the bell to end the second round and produced a characteristically energetic performance to move to 5-0. Southpaw Quezada failed to make the flyweight limit after two attempts on Friday, meaning he was not in a position to claim the vacant stepping-stone title or the world ranking that goes with it. The 26-year-old visitor struggled to deal with Barnes’ energizer-bunny style as the former European amateur champion and two-time Olympic medallist started at a lightning pace. Competing in just his fifth pro bout since turning pro 12 months ago, the Irishman was fighting in his second bout to be scheduled for 10 rounds. With trainer Danny Vaughan in his corner, the MTK Global-managed fighter was at his best in the early rounds as he regularly pinned Quezada on the ropes. After dropping the Nicaraguan in the second, Barnes continually pressured his opponent, although referee Steve Gray was forced to warn the Belfast native for a low blow in the fifth round. ‘The Leprechaun’ only needed one more round to get the job done, however, as he finished off his foe with a vicious left hook to the body in the sixth. Quezada failed to beat referee Steve Gray’s count and the official called a halt at 3mins 6secs of the round. The win means Barnes will jump up the world rankings in his pursuit of an early world-title shot. “I’m hoping to get back out in March after I have a break over the Christmas. I’d like to get out on Mick’s [Conlan] undercard in New York if I can,” said Barnes. “I knew from the second round when he [Quezada] went down that he didn’t want to know. I felt I didn’t really touch him, but he just wanted out. I kept backing him up and didn’t give him space to breath and I got the job done.